Construction on Wisconsin and Broadway looking south. 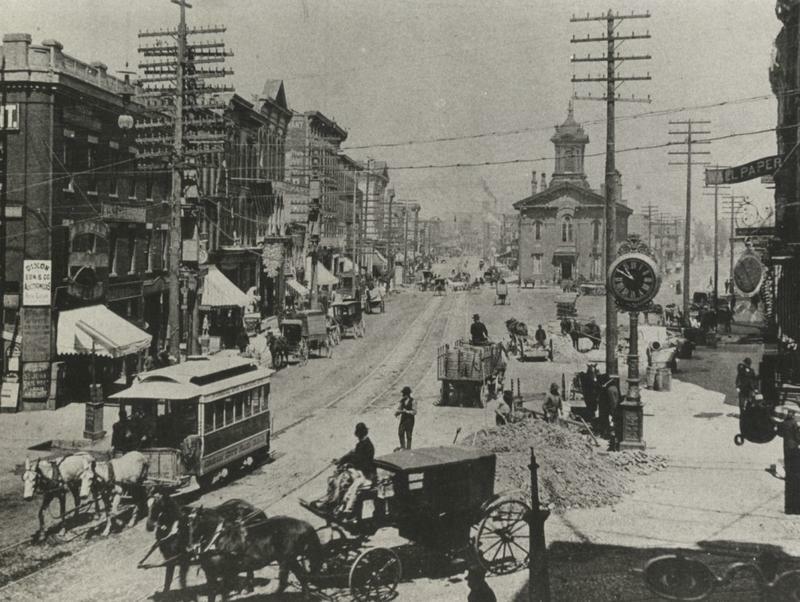 Workers lay tracks on Broadway. Orange barrels line Ogden Avenue at the north end of the route. They say, if you live around here, there are only two seasons – winter and construction. 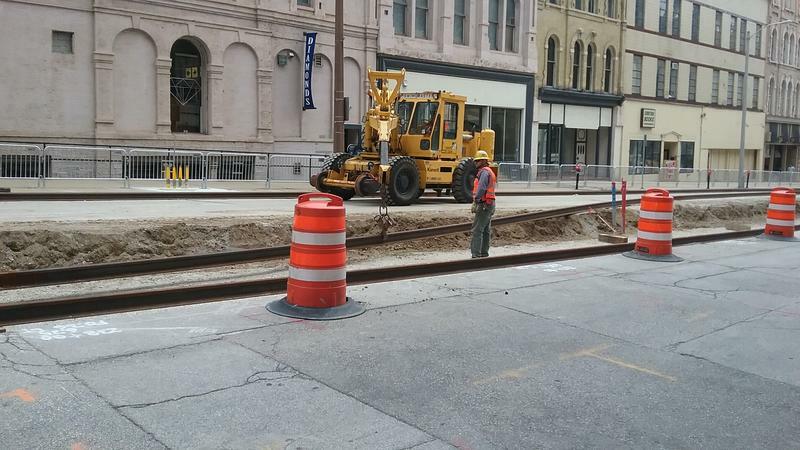 Yet, Public Works Director Ghassan Korban says even for downtown Milwaukee, this is an enormous amount of activity. 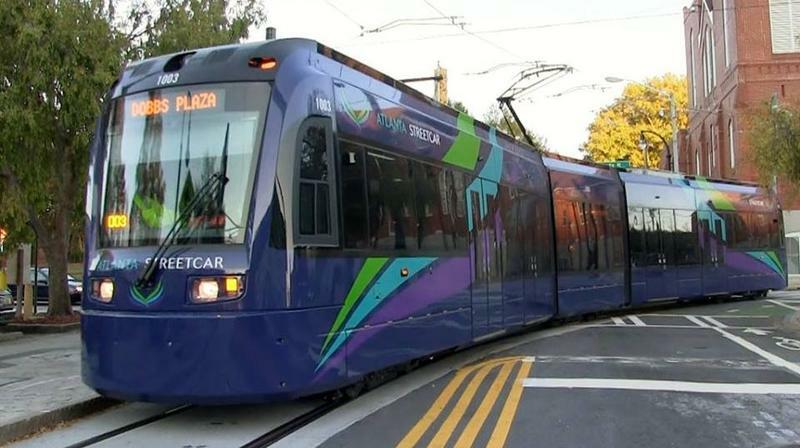 “A little bit unusual for two reasons, one is the streetcar project is going throughout the entire route," he explains. Plus, Korban says this summer is seeing huge building projects. “Whether it’s the arena, whether it’s the NML or one of the many other projects that are happening in downtown, adding to some of the congestions." Construction near the downtown post office on St. Paul Avenue started in April; workers laid the tracks and then filled in the gaps down the middle of the road with cement. Work on St. Paul Avenue is almost completed at the beginning of the route. Korban says there’s only one task left to complete at this location – installing the overhead wires. 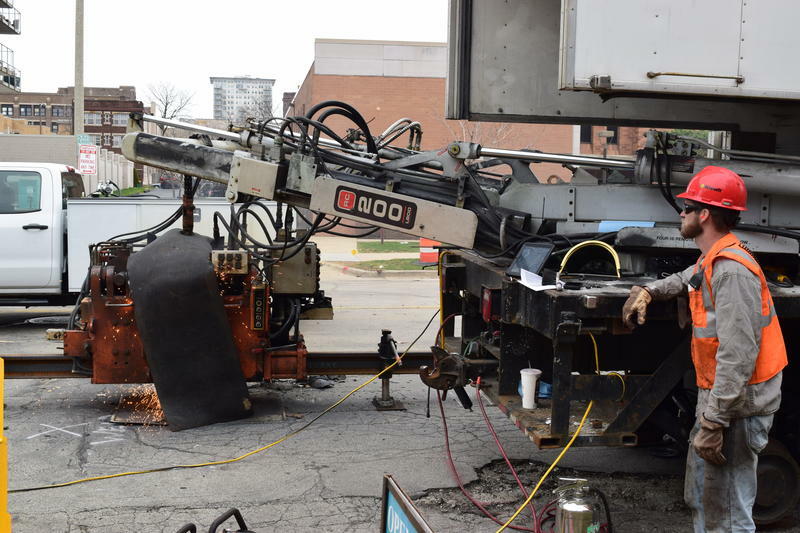 “The cables will be energizing or powering the streetcar, so that is the next phase for this stretch of the streetcar project." But, he says work on the wires won’t begin until after Summerfest, since St. Paul Avenue is one of the major paths leading to the grounds. Crews will suspend their work here for the eleven-day run of the music festival. “A lot of people who come from out of state, out of town, they’re not familiar with downtown so we want to make it as clear and as smooth and as safe as possible. So we will clear as much of the construction, signage and barrels and barricades as possible,” Korban says. While there might not be much noise or congestion on St. Paul Avenue near the beginning of the streetcar route, just a half mile away on Broadway and Wisconsin, there’s a lot of commotion. The intersection is closed while a cement truck pours concrete around freshly laid tracks. Orange barrels line a six-block gaping hole down the middle of the street. Randy Kiel is eating lunch outside a café; he lives nearby and says he doesn’t mind the disruption. “We’re okay with it because we’re looking forward to the streetcar. You have to make a few changes because you can’t cross everywhere now but that’s fine,” he says. 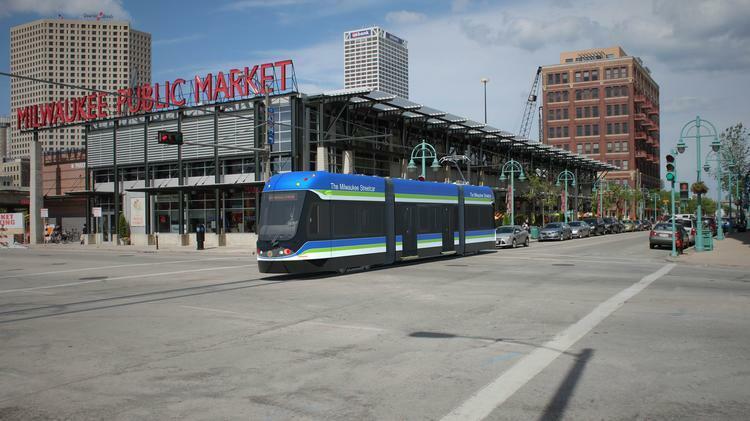 Kiel says he thinks the streetcar will bring more people to downtown businesses. Esther Jackson works at the nearby Wells building, and takes the bus here from her north side home. She says the drivers are doing a good job of staying on schedule, despite the disruptions. “It always gets me to work on time so I’m satisfied,” Jackson says. Yet, at least one shop owner says he’s lost customers. Sam Belton owns City.Net Café, a stone’s throw from the corner of Wisconsin and Broadway. He says patronage has dropped significantly, and he blames the streetcar construction. “When they started to change the parking and no parking on these side streets, you have a lot of people who would come to your business but they keep going because they can’t find a place to park,” Belton says. Belton says he hopes business picks up once workers complete the construction phase. 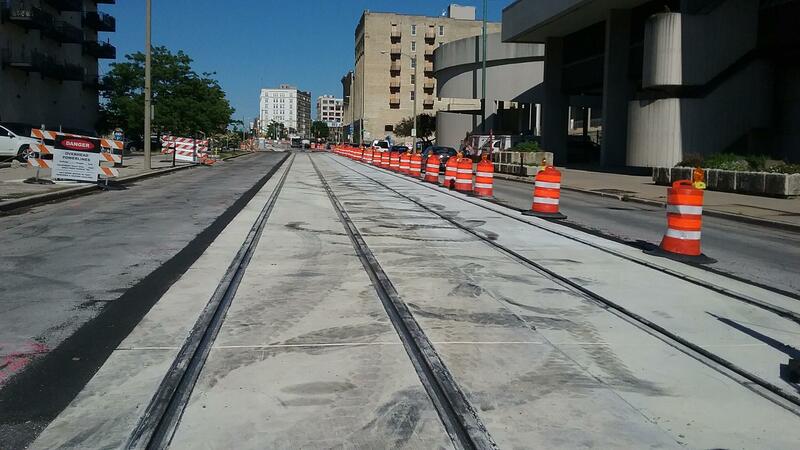 Other big tear ups related to the streetcar include Milwaukee and Water Streets near the Public Market. 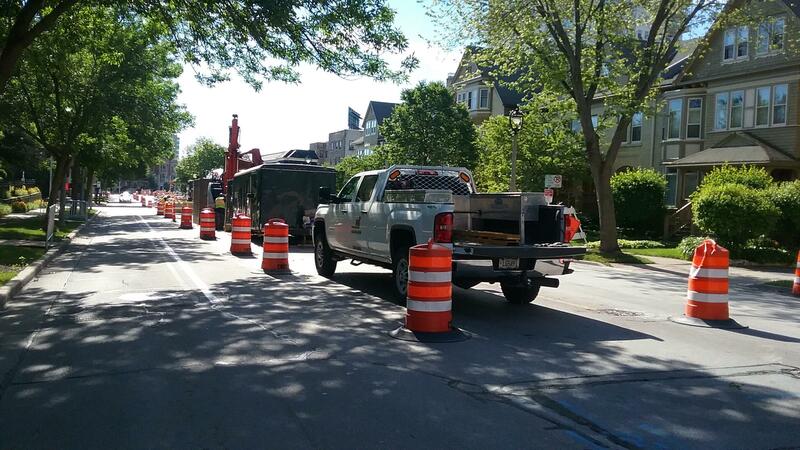 And, motorists may be noticing congestion on a six-block stretch of Ogden Avenue, a residential area at the far northern point of the route.